Municipal offices are closed today in observance of Good Friday. Our offices will reopen for normal business hours on Monday, April 21. On behalf of Township Council and my administration, I wish all our residents a warm, joyous and happy Easter and Passover. CHPD, Sustainable Cherry Hill support our "Walk with the Mayor"
This Wednesday, the Cherry Hill Police Department and several members of Sustainable Cherry Hill joined us for our last Walk with the Mayor of the season! Turnout was incredible, and along with our regular walkers, included Police Chief Bud Monaghan; dozens of officers from each of the Police Department's Units; and our friends at Kempo Family Fitness and Investors Bank, a sponsor of this year's Art Blooms Earth Festival. The Police gave our guests special gifts, including refillable CHPD water bot tles and pedometers. But most importantly, we walked about 2.3 miles (about 4,700 steps) in 40 minutes, enjoyed great conversation, and jump-started our wellness efforts for the day. Walk with the Mayor is taking a break for the summer, but we're not resting: The Mayor's Wellness Campaign will be at Earth Festival next Saturday at Croft Farm! 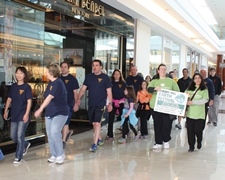 Walk with the Mayor will resume in the fall at Cherry Hill Mall. 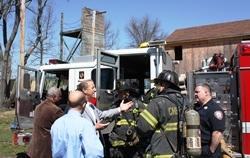 In the meantime, stay up-to-date with Mayor's Wellness by following us on Facebook, or at www.CherryHill-NJ.com/wellness. For information on Wellness events and programs, call (856) 488-7868 or email MWC@chtownship.com. The Cherry Hill Department of Engineering will continue concrete repairs on Park Drive and Grant Avenue in the Township’s Erlton South neighborhood next week as part of the 2013 Road Maintenance Program. Both roads will be open to local traffic and emergency vehicles only during construction. The department will begin a sanitary sewer line replacement on Ivy Lane between Knollwood Drive and Lantern Lane on Monday, April 21. Ivy Lane will be closed to through-traffic during this work. All work is weather-permitting. Residents with questions or concerns either of these projects should contact the Department of Engineering at (856) 424-3203. Additionally, motorists are advised that PSE&G will continue underground gas-line repairs on Brace Road between Haddonfield-Berlin Road and Borton's Mill Road from Monday, April 21, through Wednesday, April 23. Lane shifts will be implemented as necessary and delays are possible. Drivers should use caution when traveling through the work zone. 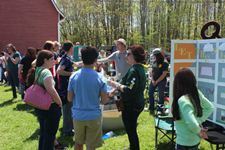 We are counting down the days until the 5th annual Art Blooms Earth Festival, set for 10 a.m. to 2 p.m. Saturday, April 26, at historic Croft Farm. More than 90 displays, vendors and activities will span the grounds at Croft Farm for this rain-or-shine event, including e-waste recycling collection, a family-friendly bike ride, entertainment, healthy food choices, and a special appearance by the Phillie Phanatic! This annual celebration of community and sustainability is hosted by Cherry Hill Township in partnership with Sustainable Cherry Hill, a 501c3 non-profit organization. Event updates are available at www.sustainablecherryhill.org. The festival is made possible in part by generous presenting sponsors: Hutchinson Plumbing, Heating and Cooling, LourdesCare of Cherry Hill and Ravitz Family Foundation; Leadership sponsors include: Sustainable Camden County, Investors Bank, M. Rosenblatt Roofing and Flaster Greenberg. For more Earth Festival information, contact Brenda Jorett at Brenda@brendajorett.com. On Thursday morning, I had the pleasure of welcoming the Camden, Burlington and Gloucester County Chambers of Commerce to the Crowne Plaza Hotel for their annual Tri-County Business Expo. This year's expo invited dozens of area companies to network and do business, and excellent opportunity for me to talk about everything that makes Cherry Hill such a great place to live, from our thriving economy to our wellness and sustainability efforts and more. 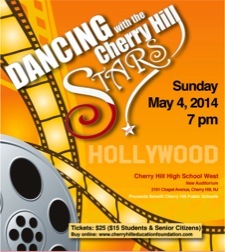 I was honored to be a part of this important event and pleased to once again host it in Cherry Hill. Local artists are invited to take part in the Township's Art Blooms juried art exhibit, April 26 - May 10 at the Croft Farm Arts Center, 100 Bortons Mill Road. This annual event features original two-dimensional works in watercolor, pastels, oils and more. All artwork is available for sale.This exhibit is open to artists of all ages and abilities. Simply complete the prospectus and bring it along with your works of art to the Croft Farm Arts Center on Wednesday, April 23 between 4 and 7 p.m. There is a $10 per entry (maximum 3 entries) non-refundable jury consideration fee. Artwork will be juried that night and artists will be notified by Friday, April 25 if they are accepted into the show. For more information, call (856) 488-7868 or email Arts@chtownship.com. For more information on Art Blooms or other activities and events planned by the Cherry Hill Arts Advisory Board, click here. Don't miss “The Great Italians,” the next installment in the Township’s Ensemble Concert series, at 3 p.m. Sunday, May 4, at historic Croft Farm. Various artists from the Philadelphia Orchestra, the Ocean City Pops and the Academy of Vocal Arts will perform selections from Puccini, Luciano Pavarotti, Mario Lanza, Frank Sinatra, Dean Martin and others. Part of Art Blooms, this promises to be a wonderful concert. Our last event sold out; buy your tickets now to ensure you won’t miss out! Tickets are $15, with discounted pricing available for seniors and students. For tickets, visit the Recreation Department in Town Hall, call (856) 488-7868, or email Arts@chtownship.com. Click here for additional information. For more information on the Arts Advisory Board and a full list of upcoming arts and cultural events, please visit the Arts Board blog at http://cherryhillarts.blogspot.com/. One additional concert has been added to this year's Art Blooms lineup: Join The Luck Brothers as they perform blues, soul and classic rock from 7-9 p.m. Saturday, May 10, at the Croft Farm Arts Center. Tickets are $5 in advance or $7 at the door. The Luck Brothers have written for, performed or recorded with Lou Rawls, Sister Sledge, the Bee Gees, Anita Baker, Lionel Ritchie and many others. Tickets can be purchased in Room 102 of the Municipal Building, or reserved by calling (856) 488-7868 or emailing Arts@chtownship.com. Good luck to the Cherry Hill East boys' baseball team, as they prepare to compete in the Mingo Bay Tournament Championship game this afternoon in Myrtle Beach, S.C. Council President Dave Fleisher and his family joined the team and players' families for the tournament this week, and are pictured here with Coach Eric Radbill and the entire team after their victory in the semifinals. East's boys' baseball and girls' softball teams both competed in Myrtle Beach this week. Congratulations to both teams on making their hometown proud! As of Monday, April 28, all Ellisburg Post Office operations will be relocated to a temporary, full-service trailer stationed in the rear parking lot of the Ellisburg Shopping Center, adjacent to the Playdrome. Again, all postal retail services will be available in the trailer. Post Office Box numbers will remain unchanged; however, P.O. Box customers will be required to pick up box keys for the new location. This can be done right at the Ellisburg retail counter starting this Monday, April 21. The Post Office will use the temporary trailer until a new, permanent location is found for the Ellisburg branch. For more information, call (856) 424-0093. Join us for a special celebration of diversity and literacy! The celebration will begin with stories read in multiple languages by librarians and guest readers from the community. The readings will be followed by a salsa performance by The Estilo Ladies Team of Philadelphia's Estilo Dance Studio. There will be cultural exhibits put together by the Junior Friends, high school cultural clubs and the Turkish Cultural Center of South Jersey. There will also be a craft table and an international cookie table so that attendees can sample cookies from all over the world! This event is and open to the public. All ages are welcome. Join the fun of the Library's 9th annual Community Flea Market and Yard Sale in the library's parking lot. (Rain date: Sunday, June 1.) Vendor spots are still available at $25 each. To reserve a spot to sell your wares, please contact Jim Gibson at jjrmp@comcast.net. Safe Babysitting Class: Open to Cherry Hill residents ages 13-16 from 6-8 p.m. May 20. All attendees will learn about fire safety, first aid and personal safety. The program is free, but class size is limited. Registration is required by May 16. Refresher Program for Lifeguards: For the 15th year in a row, the CHFD offers this in-service refresher class for lifeguards at the William G. Rohrer Center for Health Fitness in Voorhees. This year's class will include a CPR recertification. For course dates and additional details, click here. To register, email Dr. Elizabeth Speakman at Elizabeth.speakman@jefferson.edu. For more information on either of these programs, call Tammy Delucca at (856) 795-9805, ext. 1333, or email tdelucca@chfd.org. As part of its ongoing efforts to assess the impact of Hurricane Sandy on our region, Camden County is seeking residents over 18 years old to take part in a Superstorm Sandy Health & Wellness Focus Group on Thursday, May 1, at the Camden County Library's Bellmawr branch. Participants will discus house they have been and/or continue to be impacted by Hurricane Sandy. Qualified participants will receive a $20 Citgo gift card for the 90-minute discussion. Identities will be kept anonymous and confidential. The session is limited to 15 people. The focus group will take place at the library, 35 E. Browning Road in Bellmawr, from 5:30-7 p.m. on Thursday, May 1. Pre-registration is required; call the Camden County Department of Health & Human Services at (856) 374-6363 to register or for more information. Cherry Hill and Camden County have partnered to once again offer free Chair Yoga classes for Township seniors! These classes are designed to help incorporate yoga into your day, regardless of your experience level. Chair Yoga will take place in the N. John Amato Council Chambers (Room 208) at Town Hall from 1-2 p.m. on April 30 and May 7. An additional date will be added in the future. For more information, call instructor Barbara “Teddy” Piotrowski at (609) 217-4018. To register, call (856) 488-7868, or email Recreation@chtownship.com. Camden County also offers Healthy Cooking Classes, a Spring Fling Senior Dance and other events for seniors throughout the spring. Click here for the full schedule of free events. This Wednesday, the Cherry Hill Police Department and several members of Sustainable Cherry Hill joined us for our last Walk with the Mayor of the season! Turnout was incredible, and along with our regular walkers, included Police Chief Bud Monaghan; dozens of officers from each of the Police Department's Units; and our friends at Kempo Family Fitness and Investors Bank, a sponsor of this year's Art Blooms Earth Festival. The Police gave our guests special gifts, including refillable CHPD water bottles and pedometers. our wellness efforts for the day. Walk with the Mayor is taking a break for the summer, but we're not resting: The Mayor's Wellness Campaign will be at Earth Festival next Saturday at Croft Farm! 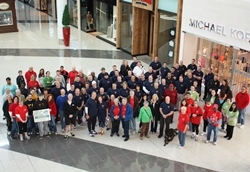 Walk with the Mayor will resume in the fall at Cherry Hill Mall. In the meantime, stay up-to-date with Mayor's Wellness by following us on Facebook [https://www.facebook.com/pages/Cherry-Hill-Mayors-Wellness-Campaign/186080851562062?fref=ts] , or at www.CherryHill-NJ.com/wellness [http://www.cherryhill-nj.com/wellness] . For information on Wellness events and programs, call (856) 488-7868 or email MWC@chtownship.com [mailto:MWC@chtownship.com] . Local artists are invited to take part in the Township's Art Blooms juried art exhibit, April 26 - May 10 at the Croft Farm Arts Center, 100 Bortons Mill Road. This annual event features original two-dimensional works in watercolor, pastels, oils and more. All artwork is available for sale.This exhibit is open to artists of all ages and abilities. Simply complete the prospectus [http://nj-cherryhill.civicplus.com/DocumentCenter/View/1342] and bring it along with your works of art to the Croft Farm Arts Center on Wednesday, April 23 between 4 and 7 p.m. There is a $10 per entry (maximum 3 entries) non-refundable jury consideration fee. Artwork will be juried that night and artists will be notified by Friday, April 25 if they are accepted into the show. For more information, call (856) 488-7868 or email Arts@chtownship.com [mailto:Arts@chtownship.com] . For more information on Art Blooms or other activities and events planned by the Cherry Hill Arts Advisory Board, click here [http://cherryhillarts.blogspot.com/2014/01/annual-art-blooms-juried-art-exhibit.html] . Don't miss “The Great Italians,” the next installment in the Township’s Ensemble Concert series, at 3 p.m. Sunday, May 4, at historic Croft Farm. Various artists from the Philadelphia Orchestra, the Ocean City Pops and the Academy of Vocal Arts will perform selections from Puccini, Luciano Pavarotti, Mario Lanza, Frank Sinatra, Dean Martin and others. Part of Art Blooms, this promises to be a wonderful concert. Our last event sold out; buy your tickets now to ensure you won’t miss out! Tickets are $15, with discounted pricing available for seniors and students. For tickets, visit the Recreation Department in Town Hall, call (856) 488-7868, or email Arts@chtownship.com [mailto:Arts@chtownship.com] . Click here for additional information [http://www.cherryhill-nj.com/DocumentCenter/View/2088] . 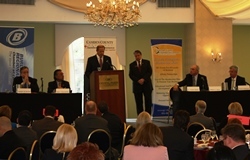 For more information on the Arts Advisory Board and a full list of upcoming arts and cultural events, please visit the Arts Board blog at http://cherryhillarts.blogspot.com/ [http://cherryhillarts.blogspot.com/] . One additional concert has been added to this year's Art Blooms lineup: Join The Luck Brothers as they perform blues, soul and classic rock from 7-9 p.m. Saturday, May 10, at the Croft Farm Arts Center. Tickets are $5 in advance or $7 at the door. The Luck Brothers have written for, performed or recorded with Lou Rawls, Sister Sledge, the Bee Gees, Anita Baker, Lionel Ritchie and many others. Tickets can be purchased in Room 102 of the Municipal Building, or reserved by calling (856) 488-7868 or emailing Arts@chtownship.com [mailto:Arts@chtownship.com] . Join the fun of the Library's 9th annual Community Flea Market and Yard Sale in the library's parking lot. (Rain date: Sunday, June 1.) Vendor spots are still available at $25 each. To reserve a spot to sell your wares, please contact Jim Gibson at jjrmp@comcast.net [mailto:jjrmp@comcast.net] . For more information on either of these programs, call Tammy Delucca at (856) 795-9805, ext. 1333, or email tdelucca@chfd.org [mailto:tdelucca@chfd.org] . Cherry Hill and Camden County have partnered to once again offer free Chair Yoga classes for Township seniors! These classes are designed to help incorporate yoga into your day, regardless of your experience level. Chair Yoga will take place in the N. John Amato Council Chambers (Room 208) at Town Hall from 1-2 p.m. on April 30 and May 7. An additional date will be added in the future. For more information, call instructor Barbara “Teddy” Piotrowski at (609) 217-4018. To register, call (856) 488-7868, or email Recreation@chtownship.com [mailto:Recreation@chtownship.com] . Camden County also offers Healthy Cooking Classes, a Spring Fling Senior Dance and other events for seniors throughout the spring. Click here for the full schedule of free events [http://www.camdencounty.com/health/senior-and-disabled-services/senior-recreation-calendar?utm_source=] .